RATING: 4/5 [in the genre] or 6/10 [all stories I’ve ever read]. FOR: Sci-fi lovers. People who enjoyed The Time Machine. CORRIDOR is a fast-paced action-adventure and will keep you hooked from the very first page. "If you are a fan of the HUNGER GAMES or THE MAZE RUNNER you will love CORRIDOR!" -Aaron Patterson, bestselling author of SWEET DREAMS and AIREL THE ONLY WAY OUT IS TO RUN. On the eve of his seventeenth birthday, Troy Goggin finds himself inexplicably transported to an impossibly huge, miles-long structure called the Corridor. But what is the Corridor, and why was he brought to it? It’s a place of mystery, wonder, and heart-stopping danger. It will test him and push him both mentally and physically. His only companion is the girl whose voice he hears inside his head, explaining the rules he must follow if he hopes to escape. But there is much more to this extraordinary place than Troy could ever imagine. The Corridor’s true purpose — the biggest mystery of all — is revealed only to those who make it to the end. Incidentally, while searching this, I found the unrelated movie by the same name that I will now be watching, because it sounds amusingly sick. But that’s neither here nor there. 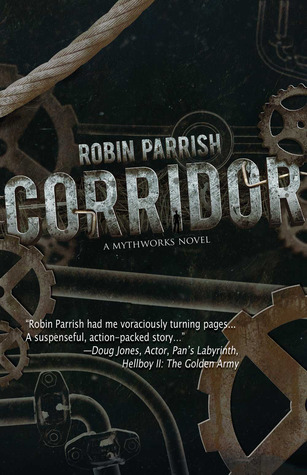 Here, we’re talking about the MythWorks novel by Robin Parrish. The concept drew me into this story immediately and, I believe, was the story’s greatest strength. Don’t expect a plot thriller. Although it starts out strong, with room-after-room of terror and near misses, the growing relationship between Troy and Victoria is just as much the focus as the journey. Plus a lot of Troy’s internal monologue—how much does he want to live? So this concept. It’s introduced from the first page. Troy wakes up in a blindingly white room full of twisting paths, with no knowledge of how he got there. His goal: find the exit. Every room is differently colored and differently dangerous, testing the limits of Troy’s tolerance for pain and torment. I won’t spoil it, but the ending really made it for me. I almost wish there had been more of an end because I was fascinated with where he ended up. The writing isn’t especially interesting or poetic, but it serves its purpose for a young adult action novel: it’s unobtrusive. Sometimes I wish it would be a little more obtrusive; in the sense that, I felt the action in the middle of the book moved too quickly. I would have liked Troy to stop and smell the roses a bit. Or at least describe in more detail what it felt like moving through the giant donut-shaped yellow room of fire. The white room was a lengthy ordeal, while some of the later rooms, despite being increasingly dangerous and deadly, were accomplished in a short amount of time. I would have preferred fewer rooms that required more time rather than the amount we were given. Now that I’ve nitpicked, I’ll say: read it! It’s extremely clever and has great atmosphere. I felt very connected with Troy and all the confusion he was feeling. The book had an air of mystery—like something arcane and mystical and alien rather than your commonplace genre use of the term. I’d tentatively compare the atmosphere I felt in the story to H.P. Lovecraft or Edgar Allen Poe, only a trifle less dark. But the feeling I had, that creeping eerie anxiety, was an approximation of what I felt while the detective was creeping into the forest ritual in “Call of Cthulu.” And what else should a book do than make a person feel?